The smell of death is all around us. Sometimes it hits the nostrils like a hammer to the skull; other times it goes undetected and unnoticed — at least to us humans. A few recent articles got me thinking about the phenomena of scent in the presence of death, or even in one case as a substitute for death. In an article (linked above) in this week’s Wired magazine, the universal “death stench” is revealed. Scientists have discovered that insects from cockroaches to caterpillars all emit the same stinky blend of fatty acids when they die, and this sinister stench sends bugs of all kinds running for their lives. Whew! 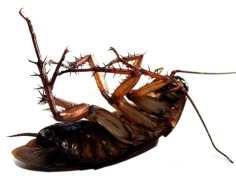 When I think of all the cockroaches I’ve lived with and killed over the years…. Of course bugs aren’t the only non-humans to release a deathly perfume. The fascinating and frighteningly named “Corpse Flower” or amorphophallus titanum, as it’s scientifically known, will affront your sense of smell like no other plant on earth. Indigenous to the tropical forests of Sumatra (but grown in a few horticultural centers stateside), the Corpse Flower emits a rotten flesh smell that has people gagging for air within 10 feet of it. And then there’s this recent news item about a morgue in San Mateo, CA, that needed to be evacuated due to the release of a chemical odor from a body undergoing an autopsy. Apparently, when the body was opened up, it was discovered that the person had ingested acetone, a colorless flammable liquid. Putrefaction is one thing, but the smell emitted from corpses that contain deadly chemicals takes things to another level. The book Aftermath, Inc.: Cleaning up After CSI Goes Home delves extensively into the subject of how bodies and body fluids are handled like toxic waste and all the steps taken to ensure safe handling. The bioremediation field is one in which the containment of smell plays a big part, not only for those working in the field, but for those friends and family left behind after the clean-up is complete. Our olfactory nerves are assaulted daily with all sorts of smells, some sweet and mouth watering and others profound and profane. However you look at it, our sense of smell lets us know we are very much alive. Posted by Kim in Death + Biology and tagged death and smell, decomposition, research. Bookmark the permalink. ← Blue Screen of Death… Memorial Tattoo?